Following the completion of a $6 million revamp in February this year, the team at Reflections Holiday Parks Seal Rocks is celebrating the announcement that the park is a finalist at the upcoming 2018 North Coast Regional Tourism Awards. The popular holiday park is part of the Reflections Holiday Parks’ group and has been recognised in the‘Caravan and Holiday Parks’ category. The North Coast Regional Tourism Awards is a celebration of the outstanding achievements of tourism operators throughout the region, with the winners to be announced on Wednesday, 25 July 2018. Reflections Holiday Parks CEO Steve Edmonds congratulated the team at Seal Rocks for their dedication to providing holidays that inspire and said this recognition from within the tourism industry confirms the park’s growing reputation as a top tourist spot. “I’m so proud of all of our parks, including those along the North Coast, which echo a similar standard of excellence across the wider group,” Mr Edmonds said. “We focus on inspiring, back-to-nature getaways and all of our parks like Seal Rocks are in amazing NSW locations, with teams dedicated to providing your perfect holiday. 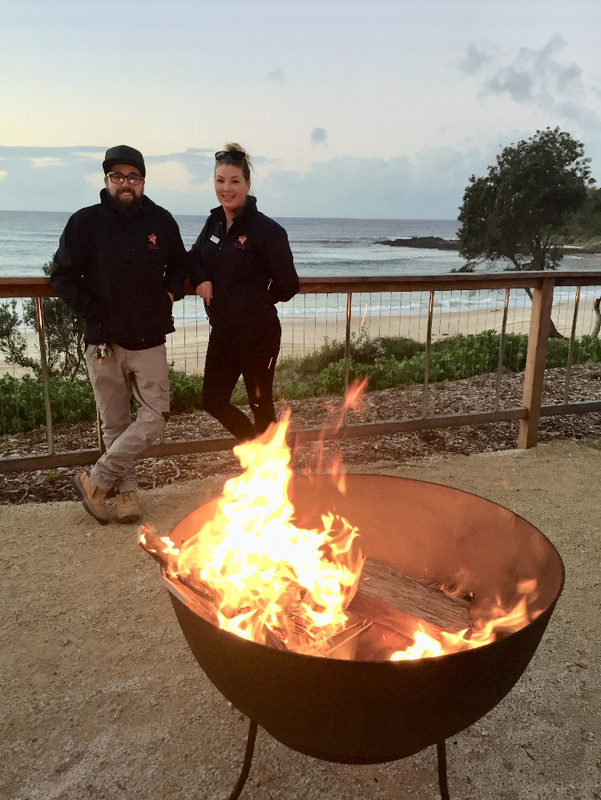 Seal Rocks Park Managers, Eddy and Justine Syme live and breathe the holiday park life and enjoy the idyllic location of Seal Rocks. Eddy and Justine’s vision is to be engaging with their guests and creating a sense of community and enjoyment. Since starting they have installed a popular communal fire pit and that is only the beginning. “We were engaged to manage Seal Rocks earlier this year and we couldn’t enjoy our role at the park more,” Justine said. Mr Edmonds said an exciting direction for the Reflections Group was their push to provide innovative new accommodation at their parks which cater to a broader range of markets. “Reflections Holiday Parks Seal Rocks received a new cabin and beach tent precinct, a new innovative guest and an improved playground designed to integrate with its coastal surroundings,” Mr Edmonds said. “We are also significantly investing in our North Coast parks at Jimmys Beach, Forster Beach, Lennox Head, Evans Head and Clarkes Beach to ensure our accommodation offerings meet the current demand and are in line with or exceed industry standards.